The Government should take a ‘carrot and stick’ approach to clamp down on mobile phone use behind the wheel, including targeting fleets directly. 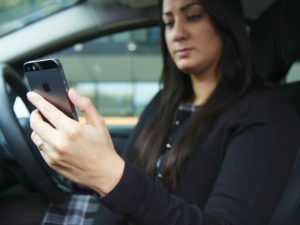 So says road safety charity IAM RoadSmart as it renews its calls for carmakers and smartphone manufacturers to work with the Government on a technological solution to distracted driving. This month is expected to see DfT Ministers meet with mobile phone manufacturers to explore proposals on using technology could block mobile signals in moving vehicles. This is in addition to the announcement last November that motorists caught using their phones will see tougher penalties. Neil Greig, director of policy and research at IAM RoadSmart, said simply hoping that drivers will ‘do the right thing’ is not enough, adding: “Every phone in use today already comes with a driving mode that can cut out calls, but they are very rarely used. “Carrots could come in the form of incentives for companies to fit new apps or to ensure their employees switch off on the go. For example, no government contracts unless you have a ‘no mobile phone use’ policy in place.